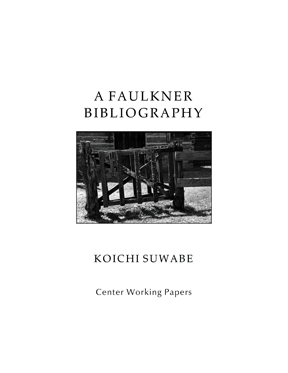 "This bibliography," writes Koichi Suwabe in the introduction to this listing of more than 1650 of the best critical and biographical writings on the most important American author of the 20th century, "is reflective of my concern with the current situation of Faulkner studies. It aims to help the students and scholars who are going to visit or revisit the big woods of Faulkner scholarship." Koichi Suwabe completed work for his PhD in the University at Buffalo Department of English in March 2004. He is presently assistant professor in the Department of Multicultural-Multilingual Studies at Tokyo Gakugei University.